Today i will discuss how to configure eBGP load balancing with single-homed BGP environment. So lets go…….. If we look our topology we see here two ISP router are connected through two link. Also this two router are in different autonomous system. Router R1 autonomous system is 21 & Router R2 autonomous system is 22. Also this loopback0 are connected via static route & loopback1 connected via eBGP. This scenario shows how to achieve load balancing when there are multiple (up to a maximum of six), equal-cost links. The links are terminated in one router at a local autonomous system (AS) and in another router at a remote AS in a single-homed BGP environment. Now we will be start our configuration part. When we put show ip route command in Router R1 then 2.2.2.2 network are learned via both static route but 12.12.12.0 network are learned via eBGP, but why r you know ? now i describe it, our both loopback ip connected via eBGP peering but loopback 0 also connected via static route. As per rule static route administrative distance value is 1 & eBGP AD value is 20, that causes 2.2.2.2 network got via static route because lowest AD value. If we want to learn 2.2.2.2 network via eBGP then we need to increase static route AD value manually greater-than 20. 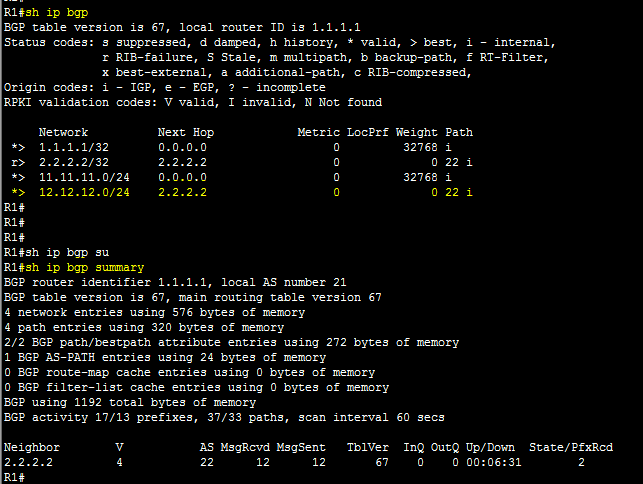 The output of the traceroute command indicates that the load is distributed between two path. In this scenario, load sharing occurs on a per-packet basis. You can also configure per-packet and per-destination load balancing with Cisco Express Forwarding. 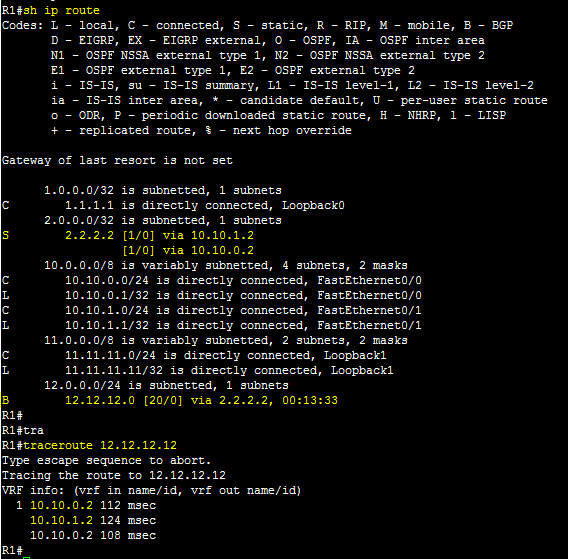 When we look bellow BGP table then we see network 2.2.2.2 is RIB failure, but 12.12.12.0 network is valid & best. this rib failure is not problem but you can solved this by increase static route AD value manually greater-than 20.